I have waited a very long time for this occasion…the first blossom! I am so thrilled that I finally have a flower to flaunt; I feel like throwing a party! How is your garden growing? Are you still digging out from the snow, or are you in one of those lovely southern climes and have to use a machete to get to the mailbox? 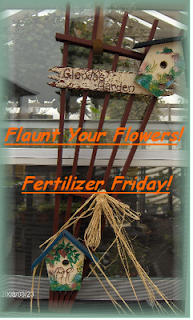 To see beautiful gardens from around the world, visit Flaunt Your Flowers Friday at Tootsie Time. Hurray for your flower!! We still have snowbanks where gardens should be but the sun is shining so I am hopeful. Have a great week, Debbie. No snow, no machete. Just gray and brown. Congrats to you! WOOOOO HOOOO!! !it is a reason for a party if I do say so myself!!! You are so lucky...no blooms here...lots of mud, snow and ice still...but the melting is going on!!! The greenhouse is still all green too....but not for long!!! I would also like to thank you for being one of the only ones that actually posts my FF logo and links back to my blog!!! I appreciate it! Congrats on your crocus! It is lovely :) It was a mild Feb in the Pac NW..and March has been wet and windy. The snow crocus started to bloom in early Feb and all things are on track for an early start to the growing season. Hoping you see more blooms soon! Thanks for visiting The Sandwich Years. It is nice to meet you! I agree that your crocus is lovely. I never tire of marveling at God's handiwork! I had daffodils last week and our Bradford pear is in full bloom... gorgeous! Hallelujah! It's spring!